21st century churches are not like their recent ancestors of the 19th and 20th centuries. Gone forever are parishes based on small communities of people who live near each other and whose children go to the same schools and play on the same Little League teams. With our members coming from such a wide community, we could never be one congregational family without modern communication techniques. Our website is designed to house our Parish information and to keep members informed on upcoming events and activities. On it you can find our weekly newsletter, Let’s Connect, distributed online and also in print form at services. You can find the online version of our monthly newsletter, mailed monthly to every family in the congregation. Also on this website you can find sections on becoming involved, information for newcomers, and Internet links to the Diocese of Spokane, the Episcopal Church, and the Anglican Communion. Getting onto our mailing and emailing lists is as simple as calling the office or sending us a request. Hear from Bishop Rehberg about the importance of Camp Cross. Many parishioners at St. Luke’s are recent newcomers to the Episcopal Church. Churches that use a formal liturgy (in our case from the Book of Common Prayer) can be confusing to people who come from non-liturgical backgrounds such as Methodist, Presbyterian and Baptist. You might be returning to a faith or church of your youth or, conversely, exploring what church might offer you for the very first time. Regardless, we invite you to join a journey to meaning and purpose founded in our relationship with God. At St. Luke’s we encourage one another in the experience of faith centered in Jesus Christ. The most important thing for newcomers is, “You are welcome at the table.” We invite you to attend services. You’ll quickly understand how our practice of the Christian faith and journey in spiritual development can support yours. From time to time, we offer four-week orientation classes that give inquirers a background for faith and practice at St. Luke's. Some members of St. Luke’s attend in order to refresh concepts taught them earlier. For additional information on the next set of classes, please contact the church office. There are many places one can learn about the Episcopal Church, including the ﻿National Episcopal Church﻿, as well as our own Diocese of Spokane. We’ve also developed a series of Frequently Asked Questions about worshiping with St. Luke’s. We invite you to explore these to answer common questions about our worship. These services combine Christian education (aka Sunday School) with our Episcopal liturgy in a child-friendly atmosphere. During the school year from September through May, The Well (9:15 AM) and The Jordan (9:00 AM) start out as separate services, providing age-appropriate interactions. The services are combined during the summer months and begin at 9:15 AM. St. Luke’s planned giving encourages its members to consider contributing financial or other assets to the church either now or as a part of an estate upon their death. This is gifting that supports our ministry beyond our normal annual operating pledge. The simplest way to do this is to make St. Luke’s the beneficiary of a gift via a will or trust. These funds are used for capital and major maintenance projects, as well as special ministry and outreach programs. To help us in our planning, we would appreciate learning about any plans to leave St. Luke's a gift. Please fill in and give this form to the parish administrator to let our Planned Giving Committee know of your plans. Confidentiality will be maintained. We are blessed to have a wonderful church and parish hall. It has been our pleasure to be able to open our doors for meetings and activities to groups within the Coeur d'Alene community. Many 12-step groups, Boys and Girl Scouts, PFLAG, PEO and others all meet regularly at our facilities. If your organization would like to use our facility for an upcoming event or meeting, please fill in the Facilities Use Application and either email it to our parish administrator or mail/drop it by our Parish office at 501 E. Wallace Avenue in Coeur d’Alene. The office is open Monday through Thursday. 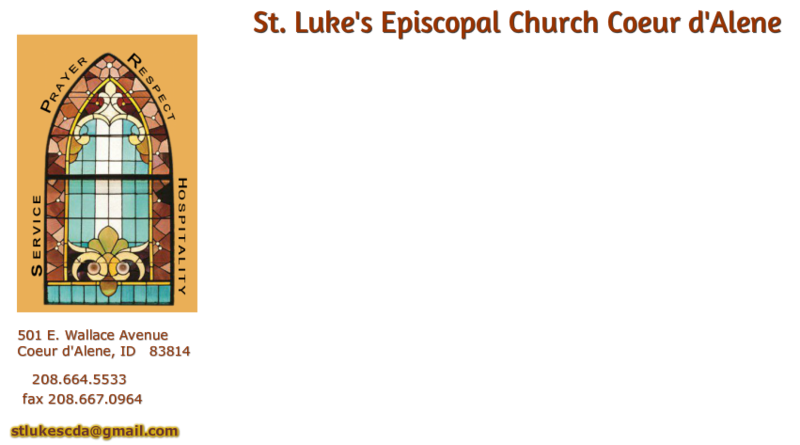 We invite you to explore St. Luke's in-depth by downloading a copy of our Annual Report. In 2011, our parish underwent an indepth congregational development plan. We invite you to explore the path we are on here.